We are vitally interested in the conversation and exchange provoked by a creative process shared between artists and young people of all ages. In the magazine we publish a feature called Grown and Growing in which we share insights from both artists and children across art forms, and inspired by some recent connections and collaborations we will now share some side by side portraits here on the blog. Michelle Aitken is 17 and a senior member of STEPS Youth Dance Company based in Perth, WA, she goes to school at John Curtin College of the Arts and is a two time Tim Winton Award recipient who hopes to never stop discovering. James O’Hara is also from WA and works internationally as a dance teacher, choreographer and performer for the likes of Ballet Junior de Geneve, Ballet Preljocaj, Ohad Naharin/Cedar Lake, The Australian Ballet/Gideon Obarzanek and most extensively with Sidi Larbi Cherkaoui and Damien Jalet. Recently James and Michelle shared time in a dance studio together during the development of “Scratch the Surface”, a work co-created by STEPS artistic director Alice Lee Holland and James O’Hara, and assisted by Isabella Stone as part of a tripple bill called THREEFOLD recently performed at the State Theatre of Western Australia. Having such incredible opportunities has hugely influenced how I engage with the arts, and dance. It’s inspiring to see people who have gone through what I’m experiencing, and have reached a place where they have the skills and the connections to do what they need to. It motivates me to keep working and to take in as much as I can from everyone who teaches us. To be around so many artists supporting us, and each other, is a really special experience. It makes me determined to stick through school when I know everything is bringing me closer to where I want to be. At the same time, knowing what’s out there beyond six subjects, six hours a day, eat when you’re told to, makes me impatient. It’s scary, feeling trapped, but uncertain as to whether I’ll actually be able to make a career for myself. Being in a studio with James has been an invaluable experience. I’ve looked up to him since seeing Faun on YouTube quite a long time ago. His classes always leave me endlessly fascinated with the ways a body can move, and I find that if I recall that experience when I’m making movement, it flows easily and softly, and between unfurling and recoiling, and moving the space with your entire surface, I could dance (or talk about it…) forever. What I take from James is a ‘fire in the belly’ feeling. Did working on the project spark any new ideas of your own? Well, having text so central to Scratch the Surface really caught my interest, so I’ve decided to write more, and try to find ways to connect performance and poetry. But I always have so many things I’m saving up. I always think; I want to do a thing about… And then I remember I’m 17 and unemployed with no professional training. But that said, I’ve been interested in Strange Loops, especially the Ouroboros as an image and a kind of feeling of completion from within, which has definitely stemmed from my experience of Scratch. 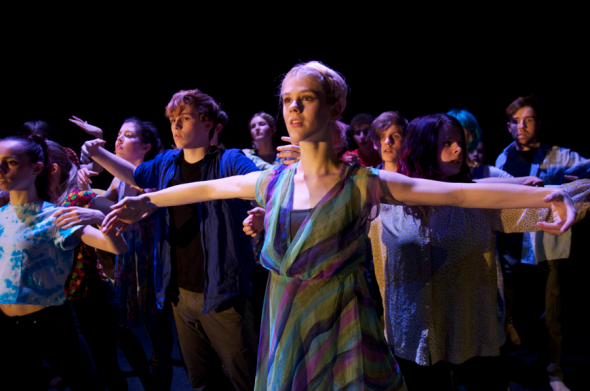 Why is an involvement with the arts so important to you at age 17? I guess I’ve always used creative pursuits as a way to keep my brain occupied, but as I’ve got older I’ve found that there’s no better place for me than where it’s ok to want to experience and explore everything, and I get to respond to that in exciting and intuitive ways. Bravery is… Being able to put all of your eggs in your favourite basket. Imagination is... Always finding new ways to see the mundane. Generosity is… Giving of yourself honestly to others, and appreciating their offers in response. James: I love working with young people and dance. I’m still discovering this, both working with them and how much I love it. I enjoy the exchange, the sharing, the communication that comes from being in the studio together. Also selfishly, I feel very free. They question allot, are very curious but never with too much judgment. I find their excitement, passion and curiosity contagious. This passion that is so inherent in them, but so hard to articulate on, is also why I was my self a member of STEPS, young and dancing 15 years ago. It’s simply refreshing to re-visit this feeling now and remember the essence of why dancing was so inexplicably important to me back then. Does your process shift depending on the age group? Actually no. Surprisingly. I suppose what shifts most are certain themes or discussions we have together, but the process I go through with them to create material doesn’t change to accommodate for their age or experience. I’m interested in their approaches and the results of their approaches to tasks that they might of never experienced before. Especially through improvisation or quick, honest response tasks. I feel like I get to meet them more thoroughly this way, their personalities and who they are as individuals really shine through, which is essentially what I’m interested in, working with them as young people who love to move. Through working with young people, my passion for making, for being on the ‘other’ side of the studio has been re-ignited and fueled. I feel hungry for more. I’m encouraged by their passion and commitment and even at times when I know we don’t fully understand what we are making, their trust, is inspiring. At moments when I throw something vague at them or even something I’m still developing in my own thoughts, I’m pushed to articulate more thoroughly what I’m thinking to them in order for them to have a clearer understanding. I’m still learning how to better process and articulate visceral sensations, or links between mental and physical ideas, so through trying to explain these to them I’m pushed into a thought process, a reflection that I’m not used to when working on my own. STEPS engages Arts professionals to inspire, mentor and work with young company members (9-25) to develop performance skills, increase confidence and engage the creative energy of dancers and audiences alike exposing them to the transformative power of dance. STEPS will be celebrating its 25th anniversary in 2014. We embarked on an adventure today to explore Kaldor Public Arts Projects 13 Rooms with the second youngest member of the BIG team, who is 4 years old. There are in fact 12 purpose built rooms in Pier 2/3, each with a door, where live performers interpret some of the worlds best known performance artists conceptual work. It is like a labyrinth of unexpected surprise with each room containing a unique experience. Almost like a choose your own adventure story we journeyed through the rooms at Twyla’s pace following her interest and engaging for as long or as little time as she liked. There were tribes of children enjoying the spaces today all of whom were welcomed into the experience by the performers and gallery staff, and in turn participated with interest, enthusiasm and respect. There was an overwhelming sense of shared experience and a true disruption of hierarchy in that children and adults genuinely shared the performance spaces side by side, interacting and contributing to the nature of the work together. “They are concentrating so hard. I love this room because every time I come in I almost get squashed! You have to make the same rhythm with your feet to get out of the way.” Twyla, age 4. 2. In Swap 2011 by Roman Ondak a performer facilitates an improvised process of negotiating the swapping of personal objects offered by audience members. Talk to children beforehand to see if they would like to take something to exchange. We spent more than 45 minutes in this room and Twyla was thrilled to swap a small brooch for an eco shopping bag. Another little girl swapped a pencil and an impromptu story about a gnome for some easter eggs. 3. 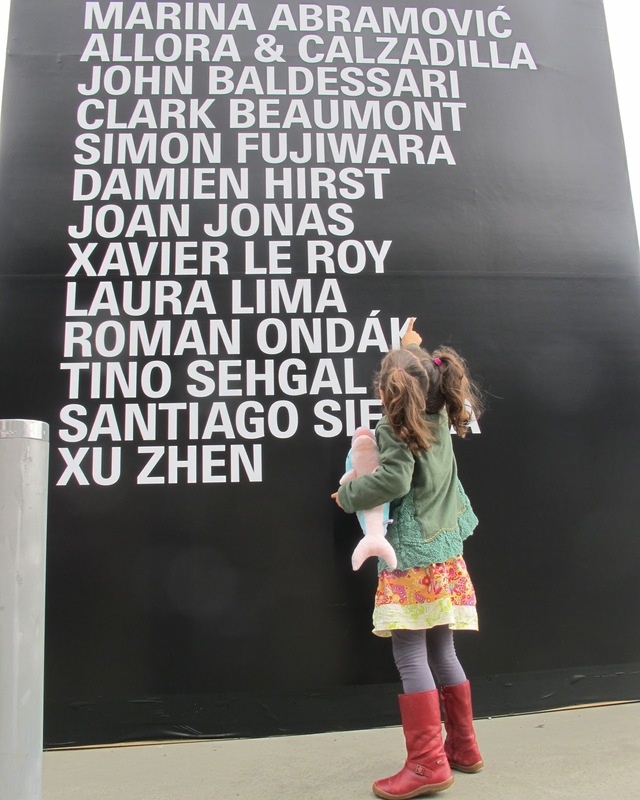 Make sure you ask for the responsive children’s program on entering the wharf. There are coloured pencils on the table in the cafe so bring some paper so you can draw your responses to your favourite rooms together, or write down as many words as you can to describe your experience. 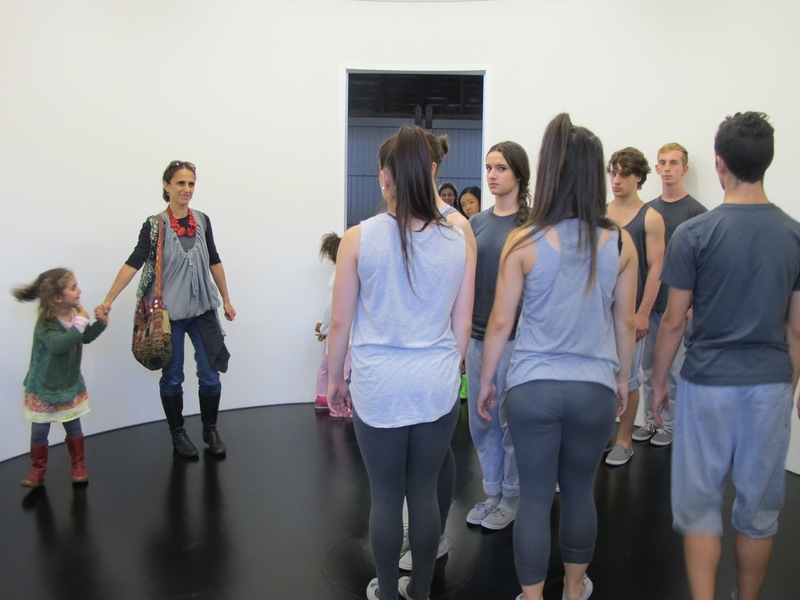 We currently have close friends performing in Kaldor Public Art Projects 13 Rooms, a ‘living sculpture’ exhibition showing at Walsh Bay in Sydney. The nature of some of the work being shown has raised questions about whether certain aspects are appropriate for children. 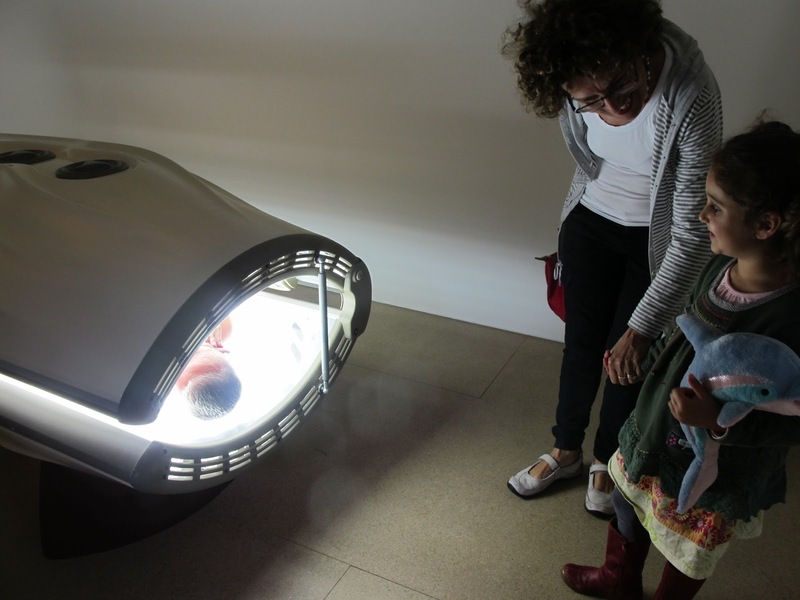 We are interested in provoking a dialogue about the relevance of contemporary artwork in public contexts to the life and experience of a child. What is the impact of children being exposed to work that is not designed specifically for young eyes? As the creators of BIG Kids Magazine we are interested in inviting children into public art spaces in age appropriate ways where their views are valued and they are supported to participate and contribute to cultural conversations. 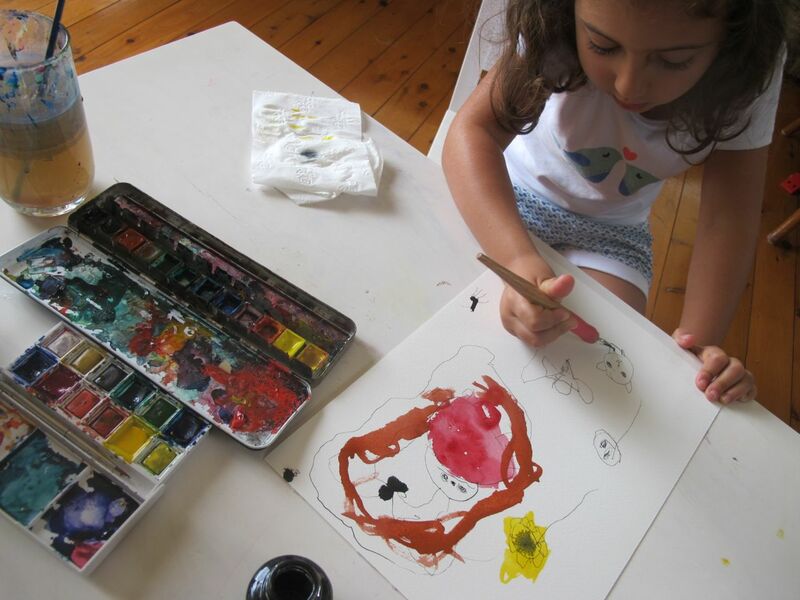 As artists, gallery and theatre spaces are like home to us and as such our children are growing up with these environments as part of their everyday lives. 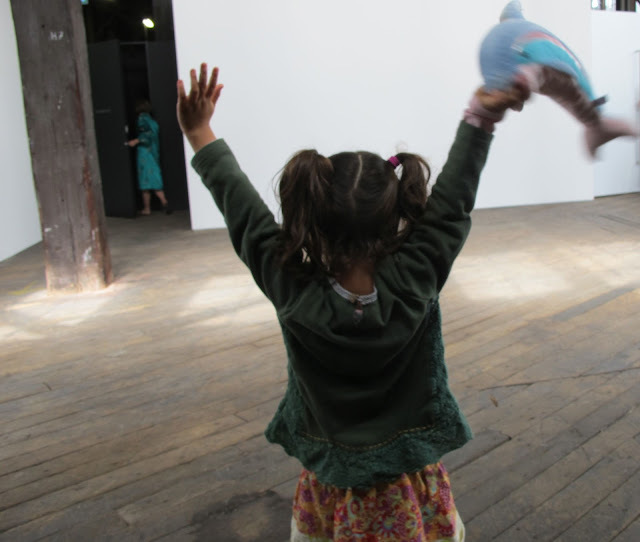 We believe in the importance of inviting ALL children into contemporary arts spaces from a young age. Lucky for us in Australia most of the major galleries have wonderful arts programs geared towards children and families that help kids engage and respond to work that is usually curated for an adult audience. 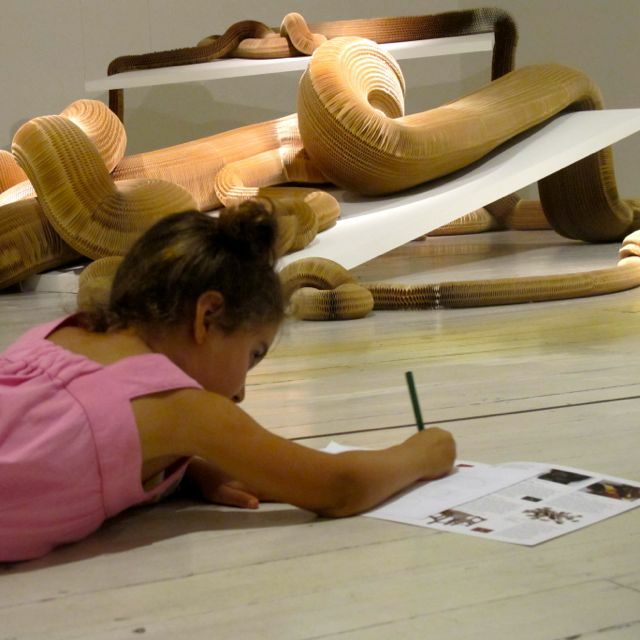 BIG is very much interested in inviting children into the process and rigorous practice of art making and exposing them to original work and live performance. Theatre and gallery spaces can provoke different ways of seeing, provide opportunities to develop personal perspectives and unique points of view, as well as open doors to new kinds of conversations between kids and grown ups. 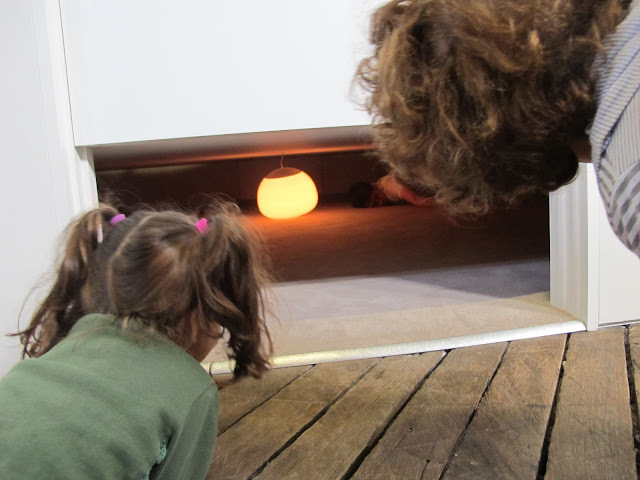 While galleries tend to invite a particular kind of attention, engagement and behaviour that some might find stifling or difficult, there are many ways to support even very young children to have positive and deeply impacting experiences. 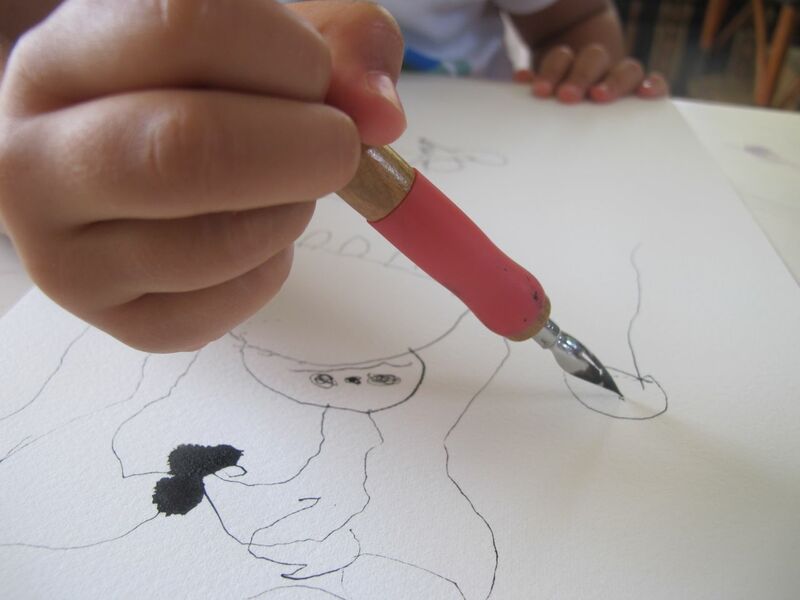 Early exposure to complex, creative and diverse environments offers children an opportunity to begin a lifelong relationship with creative thinking and the arts. With support galleries can become fertile and inspiring environments for children where they can develop expressive language and confidence in their own unique opinions. Galleries are public spaces. However, so often we have found talking to friends that they feel they are ‘not for them’ that the art gallery is an exclusive place for ‘people in the know’. Major galleries can feel overwhelming, but by considering simple parameters and realistic expectations the experience is often shared, rich and memorable. We advocate to empower grown-ups to help their kids understand the culture of the environment and what is expected of them in real and practical ways through our ongoing sharing of BIG ideas. 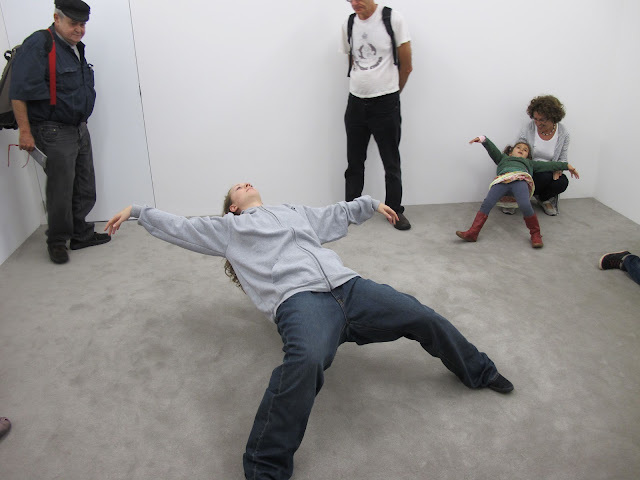 Tomorrow we will post a response to the experience of viewing 13 Rooms with a 4 year old. We will definitely be going for a babycino beforehand to talk about ways of navigating the adventure together! 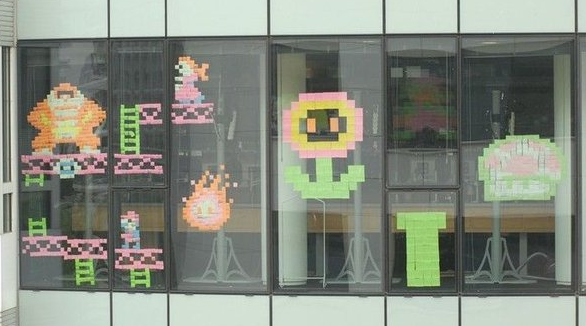 All over the world office workers are communicating creatively across city streets with images created out of post-it notes. 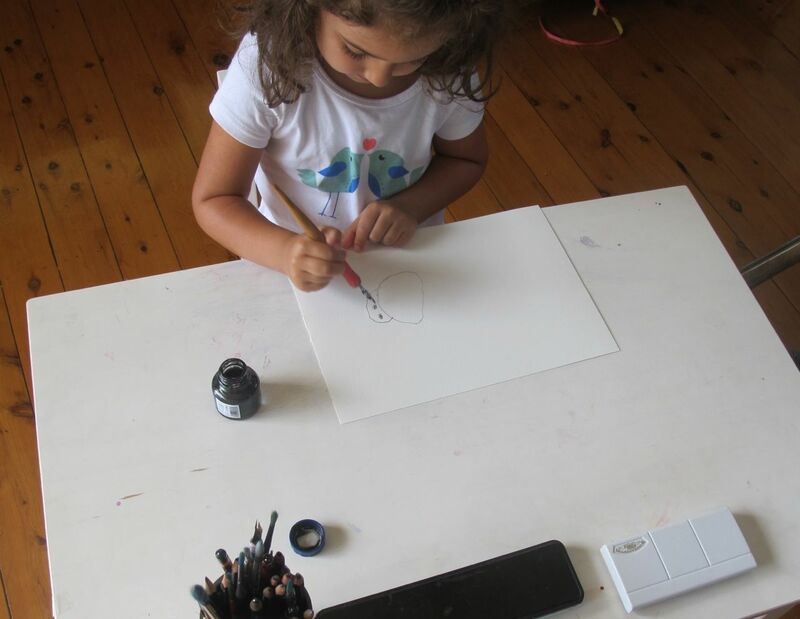 Our littlest BIG team member Nadia, age 3, is creating her very own cutting edge work exhibiting now on fridges, walls and windows. From Post-it war inter-enterprises France. 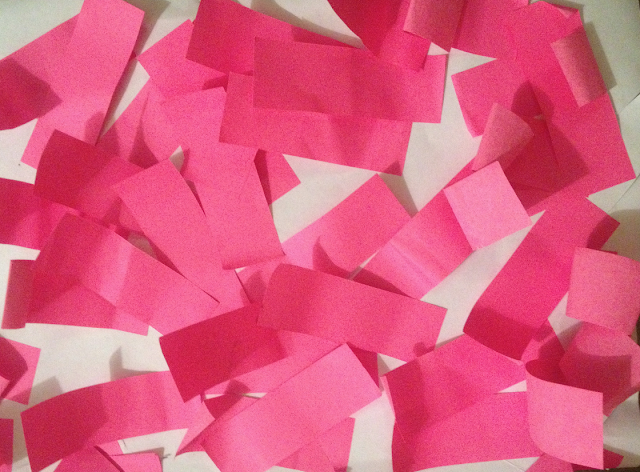 Pick up a packet of coloured sticky notes from the supermarket and make a masterpiece like the post-it painters! Simply put out a sheet of paper and let your child follow their interest. 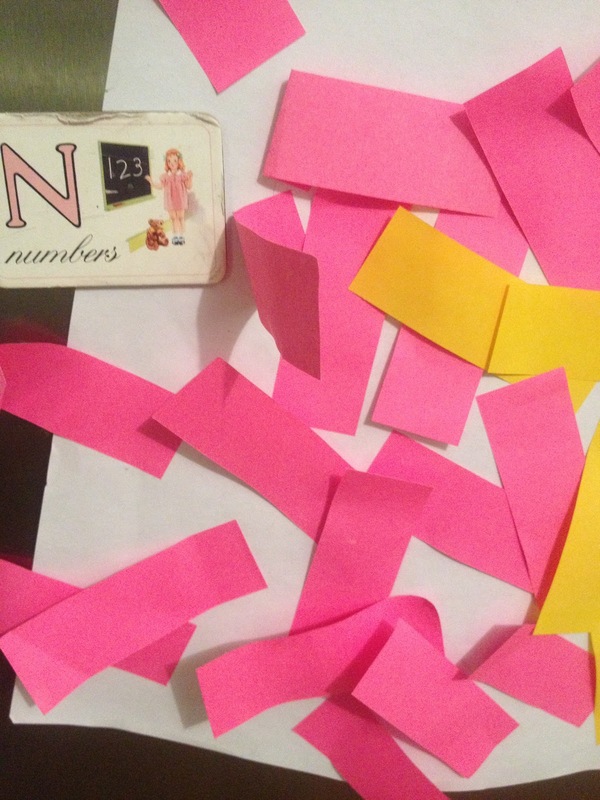 Post-it study in pink, Nadia, age 3. Collage is the art of glueing cut shapes and images onto a page. There is something wonderful about the far reaching mess of pages spread across the floor and the physical act of sifting and sorting to find the paper treasures that attract your eye. The collage process can be an intuitive experience of addition and layering, or a conscious way of creating landscapes and figures. 1. Cut images, shapes and textures out of old art, food and gardening magazines. Sometimes local newsagents will give you magazines with the covers ripped off once they are out of date. 2. Place the shapes onto the page and play with the arrangements before sticking them down, or begin with glue and follow the trails of your own sticking. 3. 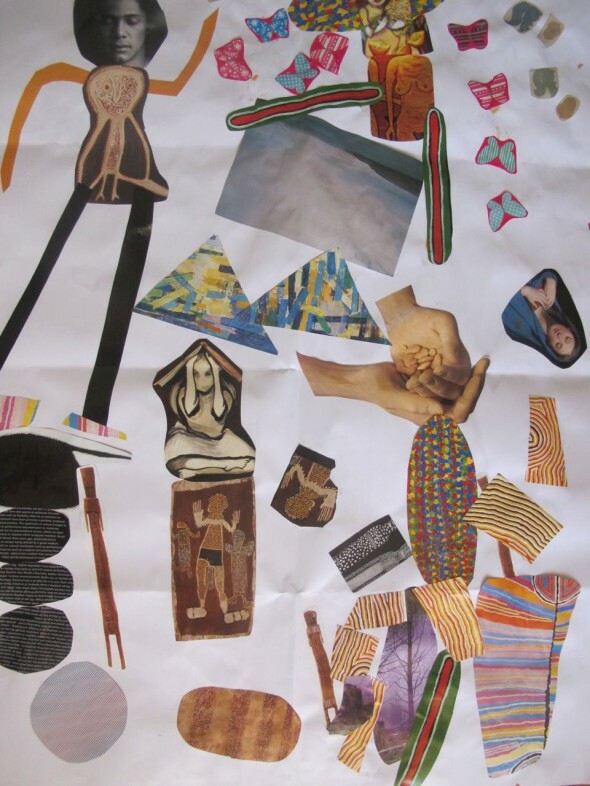 Create a self-portrait collage choosing unusual objects and textures for your head, body, arms and legs. 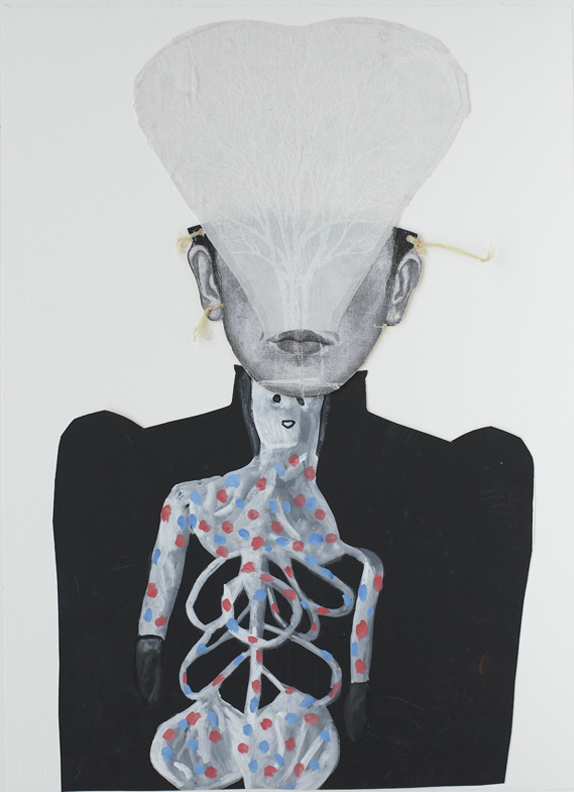 Our cover artist for Issue 2 – Treasure Maps Jacqui Stockdale works with collage to create conglomerate figures of her imagining. Treasure Maps is almost SOLD OUT. Purchase it now to find your way to the gold inside. 1. Good quality artists materials. In this case black indian ink, an ink nib and holder, watercolours and watercolour paper. Buying student quality materials in art supply stores is a cheaper option. 2. A special work space and conversation about how to care for the materials before beginning. You could talk about mixing colours in a separate palette so the actual tray doesn’t get muddy and how to wash the brush well in between colours. Twyla loves the process of caring for special materials and knows that at other times she can body paint with pools of colour on large pieces of paper. 3. Allowing an expanse of time for exploration and discovery. 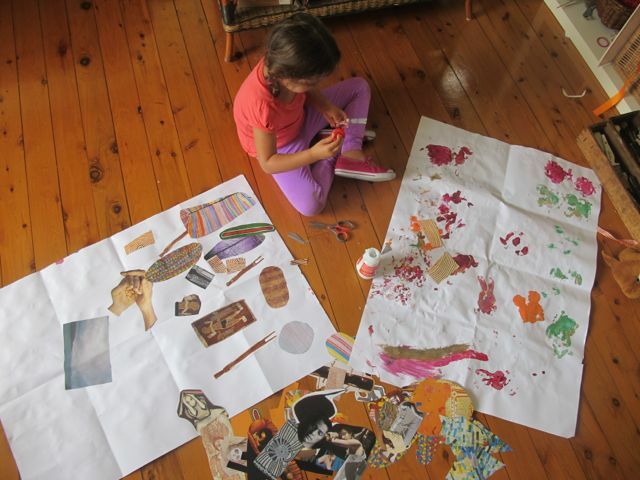 We share the excitement when Twyla comes across ways of using materials that I have not discovered before. A special space created for exploring new techniques with quiet and attention. Learning to hold the nib and move it across the page and discovering that it works best in one direction. Delighting in accidental drips and drops that can be turned into unexpected aspects of her work. The whole time she works she tells the stories of the characters being born onto her page. Her lines are alive and the story literally comes to life through her marks and colours. I am painting over their heads so it looks like they are under their blankets.